Erin and Luis Chicago sunrise engagement. Overlooking the Michigan lake while the sun rise at the horizon. I think sunrise engagement sessions are a unique way to photograph this special moment of your life and to feature Chicago in the background. As a photographer, I love the warm and clean light of the morning. I love the everchanging shades of reds giving way to a pure light. 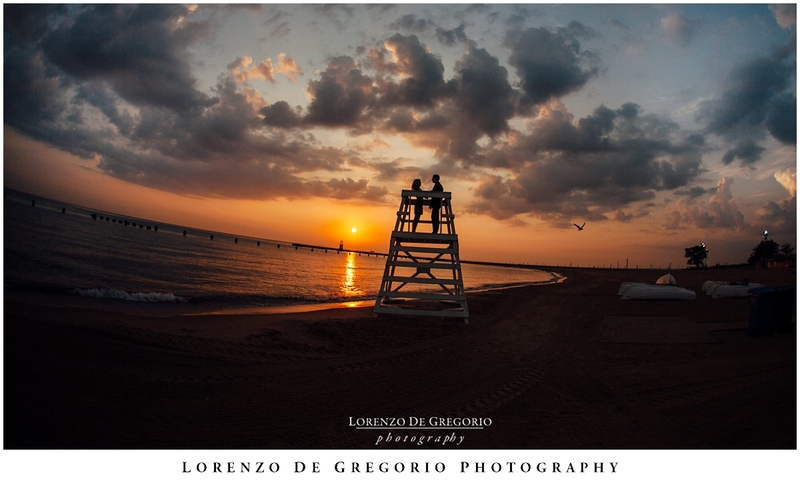 Another reason why I love Chicago sunrise engagement session is the experience for my couples. Imagine that town that you grew to know as busy and fast …all of sudden is very very different. Slow paced. We might spot a fisherman and a jogger, but we will really have the place to ourselves. The lake is silent. You can hear the seagulls and the wave braking ashore. It is really easy to focus just on the couple. There couldn’t be a better way to put this moment of your relationship in pictures. This morning we waited for the sun by Castaways, the funny boat shaped bar by North Avenue Beach. I like all the features of this location: the dunes, the bell for the boats, the colorful kajak rentals. And the cityscape is unique. The contrast between the sand and the metropoli in the background couldn’t be sharper. While the sun was rising, we moved to the nearby Lincoln Park, because the trees shelters the first harsh light of the day. Greeting a new day by the beach at North Avenue, Chicago. Erin and Luis by the Castaways building. This portrait was made with a manual Petzval lens, which impresses a circular blur to the center of the photo. Finally we moved to the Caldwell Lili pool, in Lincoln Park. 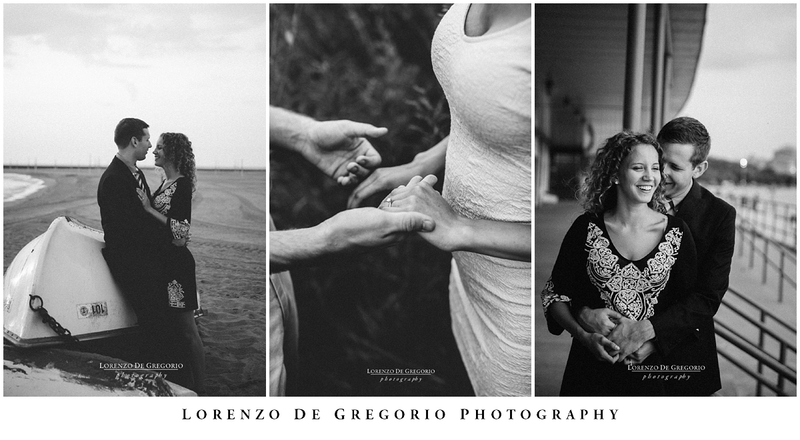 If you liked this collection and you are considering a sunrise engagement session, you should check Ashley and Dan’s downtown Chicago shoot, Sheila and Brian’s e-session or Ashley and Chad’s Millennium engagement photos. Need more ideas? you might love Se Won and Phil’s pictures in downtown Chicago and if you are looking for something completely different, then browse the fall photos of Brittany and Matt at the Morton Arboretum.